One of the reasons Tower Site of the Week tries to spend as much time as we can out west is that the western half of the country has something we here in the east are sadly lacking: some serious mountaintop elevation for TV and FM signals. This week’s Site of the Week begins at one of the last of the major Southern California mountaintops we’d yet to feature here. At roughly 4000 feet above sea level, this site is second in elevation only to the mighty Mount Wilson, 90 miles away to the southeast. But while Wilson is reachable (most of the time) by a fairly easy paved drive up from Pasadena, the reason it took us so long to get to Broadcast Peak is that it’s one of the least accessible of the western coastal sites. 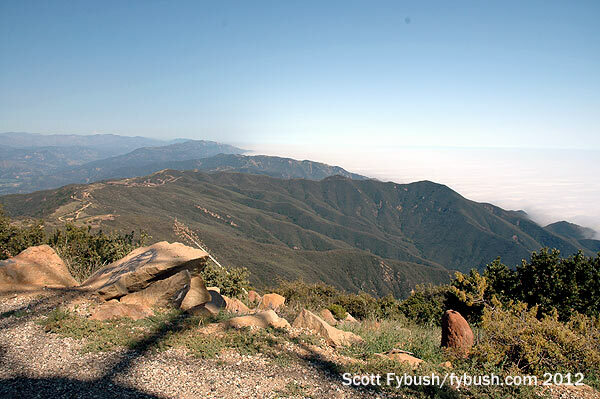 There are two ways to get up to the twisty dirt fire road, Camino de Cielo, that winds its way along the crest of the Santa Ynez Mountains, and they’re both equally challenging. From the east, there’s access off Highway 154, which rises into the mountains from the west side of Santa Barbara; our drive up on this foggy day took the western approach, following coastal Highway 101 past Goleta to the Refugio Road exit, where the road begins winding its way up from the beach. We broke out of the fog a few thousand feet up, where the coastal forest gives way to higher-elevation scrub and the pavement gives way to a narrow track of dirt. If the coastal fog weren’t so heavy, we’d be able to see straight down to the ocean from here, with a line of sight stretching all along the coast down past Ventura and Oxnard to Malibu. But the fog is that heavy – so instead, we turn our attention up to the cluster of towers on the peak here. There are two groups of towers here, one significantly newer than the other. The oldest group sits right at the top of the hill, crowned by the lone painted tower up here. This is KEYT (Channel 3), and it’s been here ever since the station signed on in 1953 as the second TV station between Los Angeles and San Francisco. Even then, the station’s founders knew that Santa Barbara by itself wasn’t quite big enough to support a TV station, which is why KEYT ended up at this site, which is both far enough west and up high enough to provide a useful signal to a wide swath of the coast, northward to Santa Maria and parts of San Luis Obispo and southward toward LA. 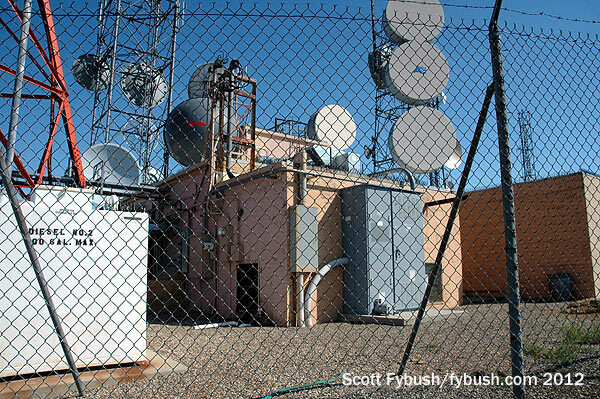 FM arrived here in 1957, in the form of KRCW (97.5), running 17.5 kW from the side of the KEYT tower; by 1965, KRCW had become KTMS-FM, a sister station to the News-Press owned KTMS (1250). 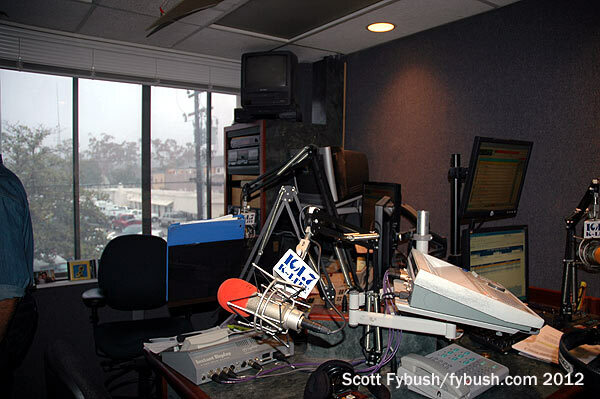 The 97.5 facility has been here ever since, albeit with lots of changes along the way: it spent much of the late 1980s and 1990s as top-40 KHTY and flipped in 1998 to smooth jazz as KMGQ. 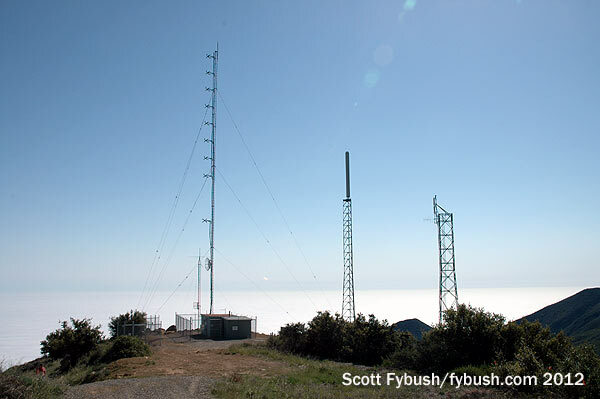 Under Cumulus, a big 2005 shuffle moved the KMGQ calls and format to the smaller Goleta-licensed 106.3 signal on Gibraltar Peak, with 97.5 taking the KRUZ calls and AC format from its neighbor up here on 103.3 (about which we’ll see more in a moment). 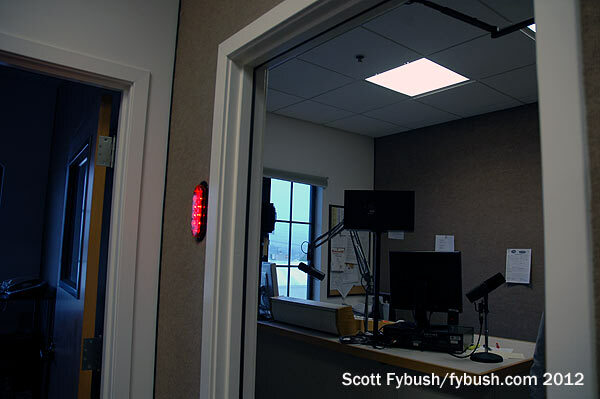 And after our visit in 2012, Cumulus sold off 97.5 to EMF Broadcasting, which is now programming Air 1 from up here as KYGA, using that four-bay Shively that’s side-mounted on the KEYT tower. 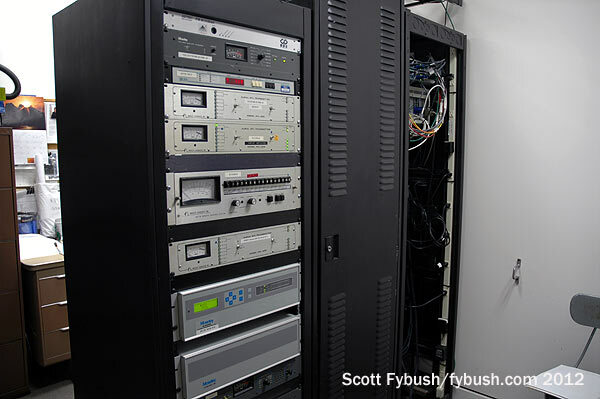 The radio voice of the University of California at Santa Barbara, KCSB, came up to the peak in 1970, operating first on 91.5 and then on 91.9, where its 620-watt signal comes from a fairly new tower just to the south of the KEYT compound. You can see the tower all the way at the right in the photo above, and you can see the pole that preceded it on Don Mussell’s collection of older Broadcast Peak photos. 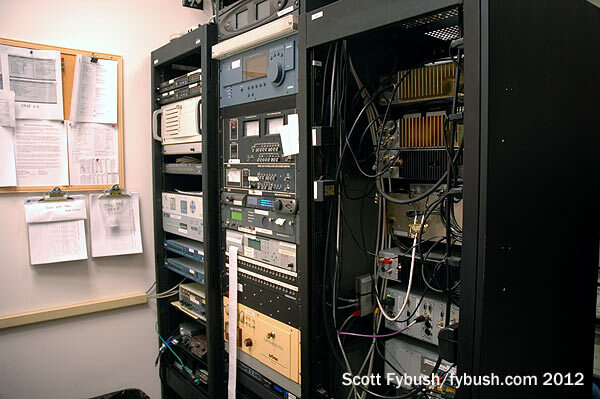 Two other full-power FMs operate from KEYT’s compound, both of them relative newcomers to the dial: what’s now KFYZ (94.5 Ellwood) came on in 1989 as rocker KCQR and was later Spanish-language KSPE-FM before handing off that format its sister station on 1490; KRAZ (105.9 Santa Ynez) came up here even later, signing on in 2001 with country, running just 65 watts from a little directional Jampro antenna mounted below the 94.5 two-bay antenna on the tower next to KEYT. 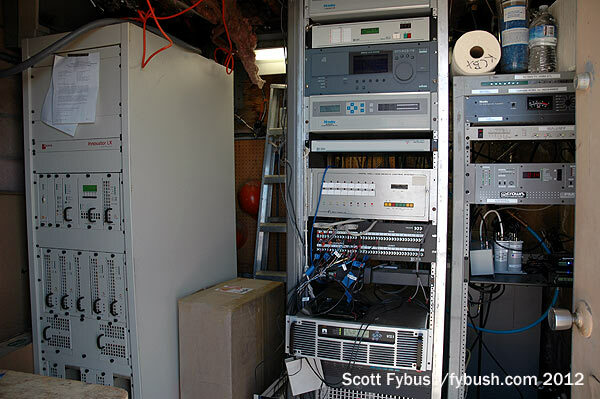 KEYT itself is now digital on RF 27, using a side-mounted antenna below the old Channel 3 batwing. 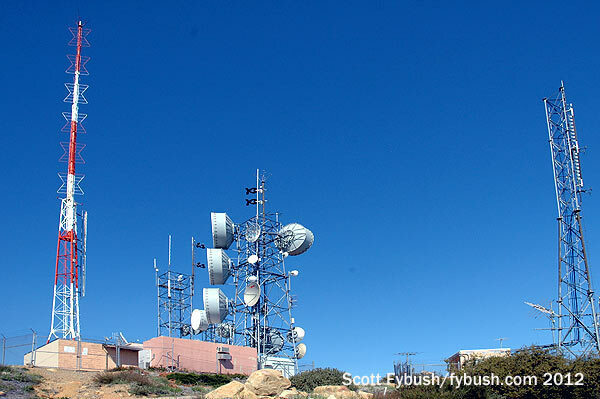 It got full-power TV company up here in 2001, in the form of KPMR (Channel 38), a full-power Univision station serving the Central Coast from a new tall tower just down the hill from the KEYT compound. 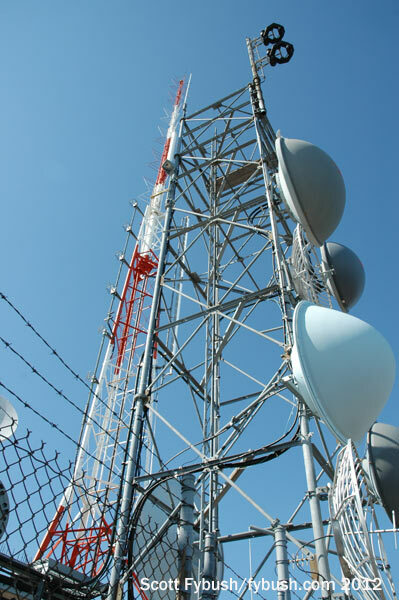 It’s now digital on RF 21, and it shares its tower with EMF’s K227BI (93.3, relaying K-Love from KLVH 88.5 San Luis Obispo) and several LPTVs. And that brings us to the biggest signal of them all. KVYB (103.3) blasts forth from the tower next to KPMR’s with a mightily grandfathered 105 kW/2968′. By Doug Smith’s calculations, that’s a whopping 18.8 dB more than the 1380 watts that a class B station would be allowed up here if it were derated by height, making it just a little bigger than its Mount Wilson superpower rivals, KPFK and KBIG. When William H. Buckley got the construction permit for this station in the late 1950s, it was KMUZ and was ticketed to run just 3100 watts on 99.9. By the time it signed on in 1961, it had gone for high power on 103.3, making the 99.9 frequency available for KGUD-FM’s debut from Gibraltar in 1963. 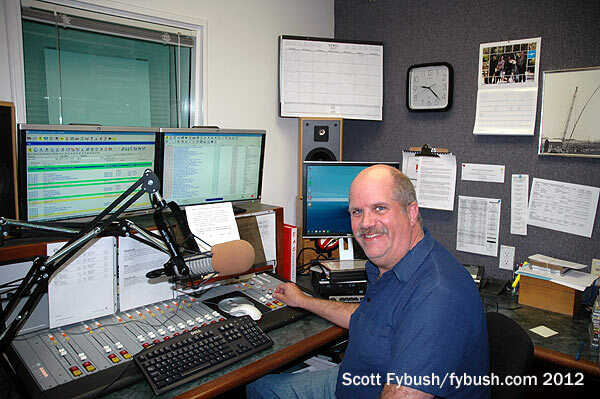 (KGUD-FM’s original CP called for operation on 107.9.) As for 103.3, it eventually traded beautiful music KMUZ for many years as adult contemporary KRUZ before Cumulus made its big 2005 shift. That sent the KRUZ AC format down to 97.5 and installed a high-energy rhythmic top-40 format here as KVYB, 103.3 the Vibe, taking advantage of the monster signal that can be heard all the way down the coast to San Diego on a good day. 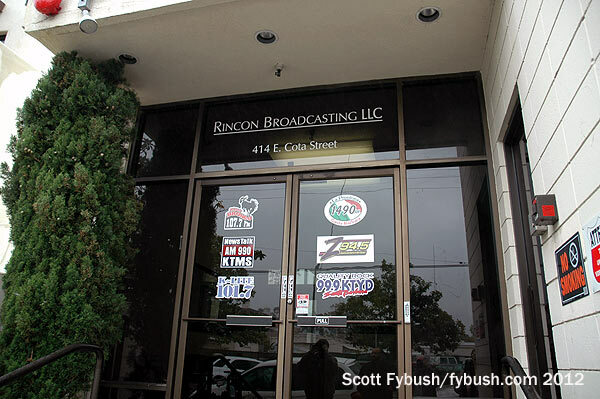 We’ll come back to the Cumulus cluster in a moment, but first we make a quick stop back in town at the 414 East Cota Street studio facility of Rincon Broadcasting. This cluster picked up most of Clear Channel’s former holdings in the market: news-talk KTMS (990), Spanish-language KSPE (1490) and KIST (107.7), top-40 KFYZ (94.5 Ellwood), AAA KTYD (99.9) and soft AC KSBL (101.7 Carpinteria). They’re all laid out in two neat rows of studios on the second floor, leading down to a big rack room that completes the “U” shape of the studio floor. 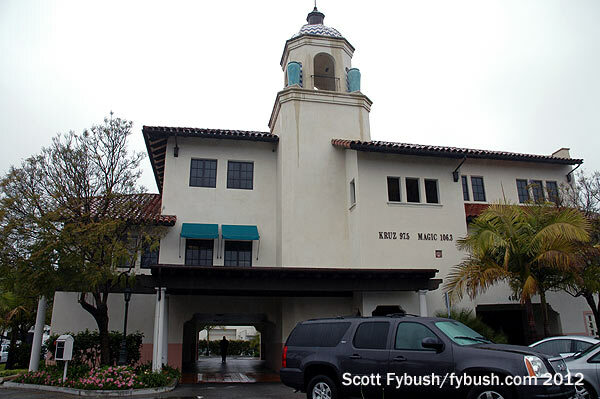 And there’s a seventh station here, too, at least for now: commercial classical KDB (93.7) is owned by the Santa Barbara Foundation, but it operates out of Rincon’s plant as part of an arrangement with the Foundation. That’s about to change: the foundation put KDB up for sale a while back, and it’s been purchased by LA-market public station KCRW (89.9). When KCRW takes over later in 2014, it will swap KDB out to another LA-based public station, classical KUSC (91.5). 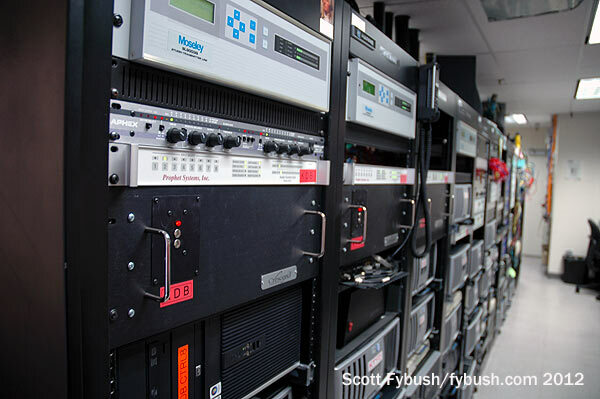 KUSC will begin programming KDB, mostly from LA, and KCRW will get the current Santa Barbara KUSC relay, KQSC (88.7). That 88.7 signal (you saw it in our look at Gibraltar Peak two weeks ago) will become a partial relay of KCRW, with additional local content from a partnership between KCRW and a local college up here. Not to be outdone, the third big LA public radio player, KPCC, just bought Gibraltar translator K210AD and will begin reaching Santa Barbara listeners soon on 89.9. Add all that to the local players, San Luis Obispo’s KCBX (via KSBX 89.5 on Gibraltar) and Thousand Oaks’ KCLU (via KCLU 1340 Santa Barbara and a Gibraltar translator), and that’s an awful lot of public radio chasing a small audience. 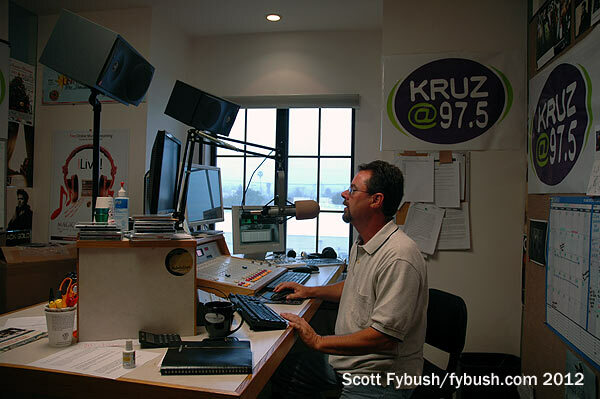 The other wing led past the bigger air studio for KRUZ (97.5), down to sales and business offices for the cluster. This is all past-tense now, because Cumulus split up this cluster just a few months after our visit. KRUZ, as noted above, went to EMF as KYGA with Air 1. KVYB was already operating from Cumulus’ Ventura cluster (as seen a few weeks back), and KRRF became part of that cluster as well after being relicensed to Oak View, just north of Ventura. That, in turn, changed KYGA’s city of license to Goleta to maintain “local service” there. It’s been a complicated few years of broadcasting in Santa Barbara, hasn’t it? Thanks to Aaron Read, Cumulus’ J.D. Strahler, Rincon’s Mike Thomas and KDB’s Steve Murphy for the tours! And don’t miss a big batch of cross-country IDs next Wednesday, over at our sister site, TopHour.com! I *think* the mystery two-bay was KRAZ 105.9FM, either their main or the backup. IIRC they had at least two arrays up there on BP, and possibly on different towers…although I think the transmitters were in the same shelter along the base. As someone who grew up in Santa Barbara and even worked for KEYT for a time in the 1970’s, your article brought back a lot of memories. 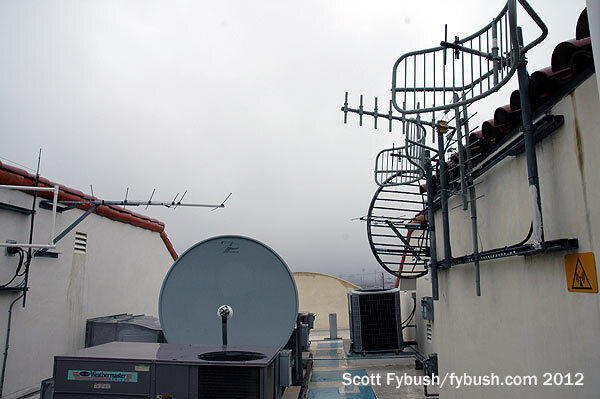 Until the arrival of KEYT, Santa Barbara was totally dependent on Los Angeles for TV reception. All of us where I lived had huge outdoor antennas on top of our garages, pointed towards Mt. Wilson. Reception quality ranged from good to nothing-but-snow, depending on the weather. But KEYT’s arrival was not universally welcomed, because a local station on channel 3 meant we had no chance of pulling in channels 2 or 4 from L.A. anymore. KEYT promised to bring us the best of everything by picking from all the networks, which they continued to do until KCOY in Santa Maria debuted in 1964 as an NBC affiliate, prompting KEYT to then become a primary ABC affiliate. The transmitter location you visited is really unparalled for its coverage, especially in the analog era. When I worked there, the engineers told me they regularly received reception reports from as far north as Monterey, and as far south as San Diego and into Mexico. Quite a reach for a small market station. Your observation about the Santa Barbara-Santa Maria-San Luis Obispo market really existing only on cable or satellite is quite accurate. People living in Santa Maria or San Luis Obispo had access to all three networks via KCOY, KSBY and KEYT, but the same mountain range that gave KEYT its reach also blocked all signals from the north from getting into Santa Barbara. Cable, of course, changed all that, and Santa Barbara was definitely ripe for cable TV. Just getting clear signals from Los Angeles was exciting enough. Eventually, the cable system did add KCOY, and much, much later, KSBY, so now it really is a unified market. 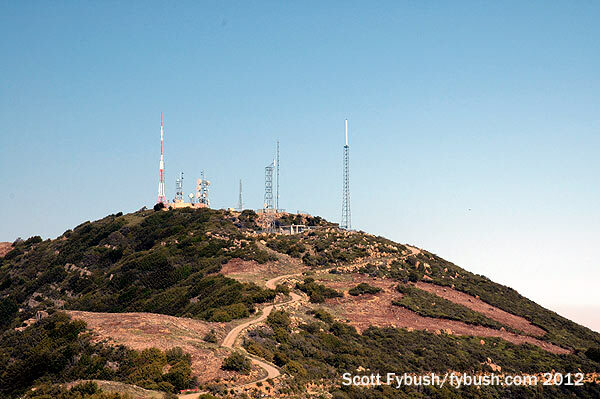 One other note: my Dad knew someone involved in the establishment of KCOY, and he said they initially wanted to put their transmitter on Gaviota Peak, a lesser mountain about 15 miles west of Broadcast Peak in the same Santa Ynez Mountains. This would have allowed them to get a decent over-the-air signal into Santa Barbara. 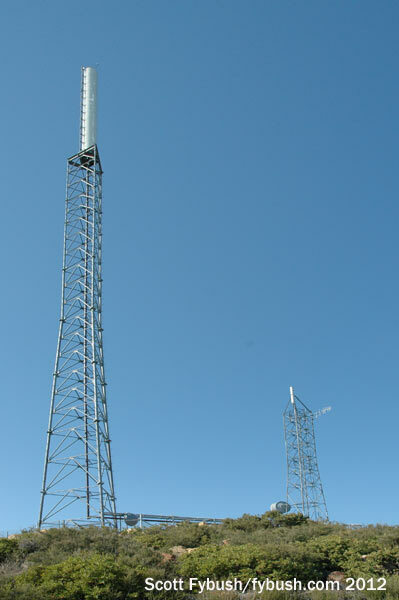 However, FCC regulations required stations to put a “grade A” signal into all parts of their city of license, and initial tests showed that the Gaviota site was just a little too far from Santa Maria to “make the grade.” So KCOY ended up on Tepusquet Peak east of the city, and blocked from over-the-air access to Santa Barbara. Thanks for coming out west and giving us a glimpse at a wonderful site.